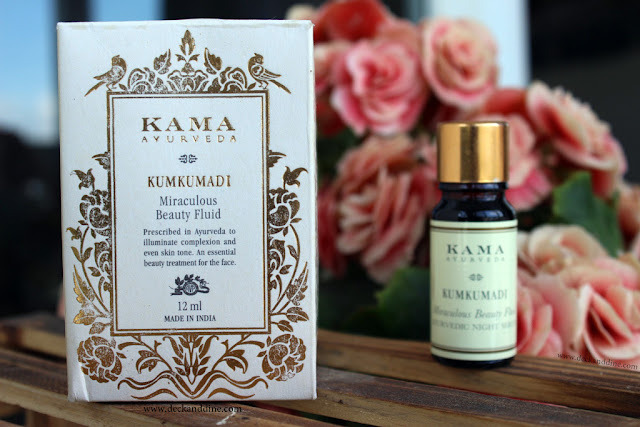 Today I will be reviewing a raved product from the beauty industry, KAMA Ayurveda Kumkumadi Miraculous Beauty Fluid. We all know how important night creams/serums are, don’t we?! After all the torture our skin goes through during the day, at night it repairs, regenerates and works in restoring the natural glow. A perfect night care regime helps in that restoration process. I purchased this on my sister’s recommendation and also have seen so many people from Blogosphere raving about this product. 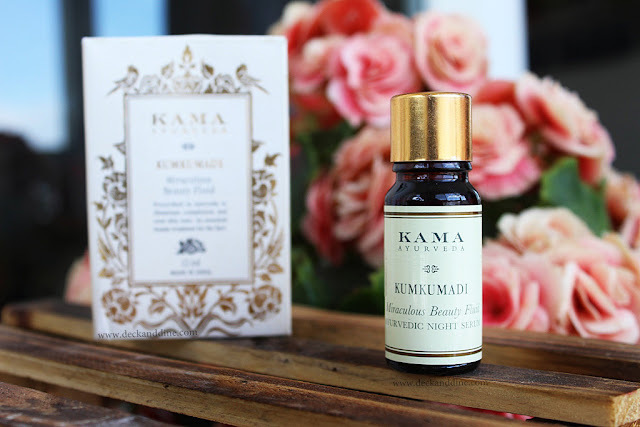 An Ayurvedic night serum made with the legendary Kumkumadi oil prescribed for dull, pigmented, damaged and aging skin. 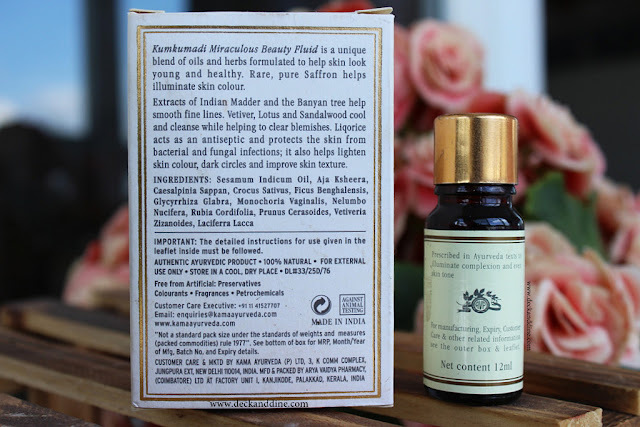 Prescribed in Ayurveda for glowing complexion and even skin tone. The fluid comes in a small, slim glass bottle with a golden cap and a stopper. The outer box has all the details of the product. It comes with a dropper as well, providing ease of application. Well, I have lost the dropper. The fluid is saffron yellow in color, has a slightly thick texture and an ohh very strong herbal fragrance. I dampen my cleansed skin with pure rose water, apply just 3-4 drops of this on my face and massage until everything gets absorbed. At first it might feel very heavy and sticky, but don’t worry, it gets absorbed soon. On the box it is written that one should use 4-5 drops, but what I have understood that one should use it according to their skin type, like if you have dry skin, then 4-5 drops is perfect; if you have normal skin then 3 drops and lesser if you have oily or combination skin. I prefer 5-6 drops during winters and during rest of the year 3-4 are perfect. I apply it one hour before hitting the sack and wake up next morning to softer, brighter and radiant looking skin. It has an illuminating effect which I completely love. 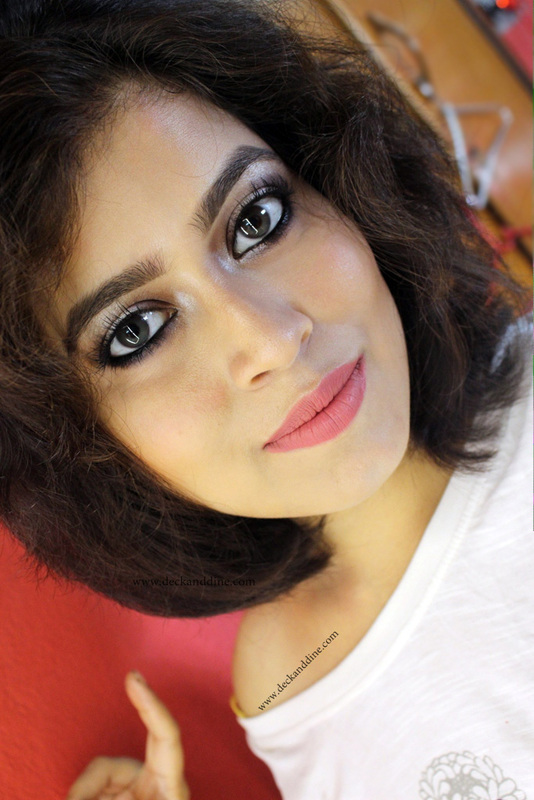 With continuous use my skin looks a lot more even-toned now. My mother in law also has her own bottle and she too, is loving the effect. We have noticed a considerable reduction in her pigmentation and dark spots. Her skin looks lot smoother, softer and brighter. However she hasn’t seen any minimization of fine lines and wrinkles. But what I feel is it is very hard for any product that is used externally can reduce the existing wrinkles. My under eye area looks a lot brighter. It might stain, so use pillow covers in darker colors. The glass jar isn’t very travel friendly. A rich, tinted facial oil that sinks into damp skin to impart a luminous glow and even toned skin. It is one of the best night serums I have used till date. Yes, it is expensive, but I don’t really mind spending on a product that works so well. I use it every night and a bottle lasts me for almost 45 days. Give this product a try. It is indeed a magical beauty fluid. I have few comments regarding this product. First and foremost thing, it's not manufactured by kama ayurveda. It's made by arya vaidya pharmacy, coimbatore. You can see the packaging box. It's so high priced where it's actually available from the brand who manufactured it for a much lesser price.... Plus, clearly this product is not for sensitive skin.... Any kumkumadi tailam can improve skin pigmentation and spots. There are a lot of good variants avlb in market... Especially the kottakkal one is avlb for 300-400 rs which is the best selling kumkumadi tailam. I have heard so much from it. Will gather fudge and splurge this time. Very detained post. Just what I wanted. The price is too much for the quantity provided. They would have at lest provided a dropper bottle to use easily. It's indeed quite pricey for what you get, however if it works well than its worth trying! I have used Kumkumadi oil few years back and totally loved it. Even my mom loved this oil, i could see how radiant and clear this makes the skin. 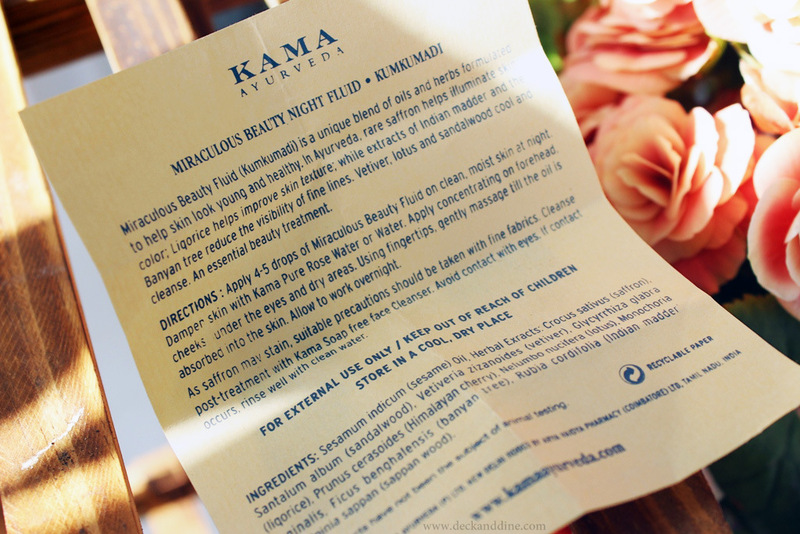 I need to try Kama Ayurveda products. My sister gave samples of some of their products from her fab bag. I think i loved them. Great review. I love this Kumkumadi Tailam. Sadly my face is going through a breakout phase and I'm not able to use it. Otherwise this is an amazing product.